Augmented reality isn’t always totally pointless. Sorry if you think it’s hugely useful to see an augmented view of tweets around you just by holding up your phone, but I like to find slightly more advanced applications using the technology. One such app, MagicPlan, fits that description. From the two-year old startup Sensopia, the MagicPlan iOS app is rolling out version 2.0 of its floor plan capturing application today, which allows you to hold up your phone then scan the dimensions of the room to create an instant floor plan. Once created, the plan can be exported to DXF, PDF, JPEG and even HTML for viewing on the web. While it’s not quite as easy as something like Occipital’s 360Panorama, for instance (I highly recommend you not skip the MagicPlan intro video), the app is pretty magical. You just stand in one spot in the center of the room, move the camera around tapping on the screen to label corners and doors. It doesn’t even matter if furniture is in the way. 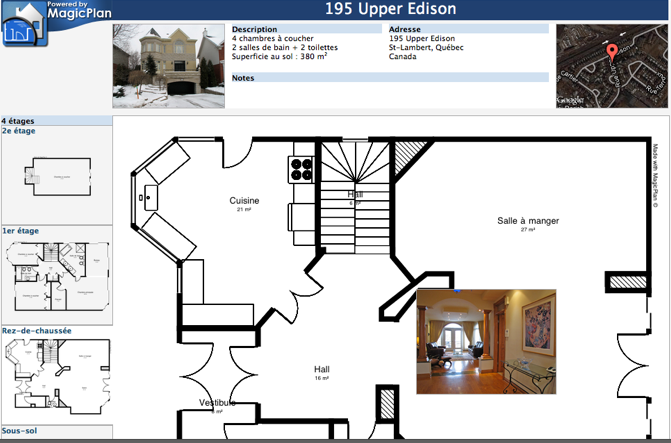 The floor plans the app creates are available for free, but only for non-commercial use. For commercial use (and to remove the watermark), subscription plans are available, as is enterprise pricing. Over one million users downloaded the original version of MagicPlan released last year, and version 2.0 brings a number of improvements based on user feedback, including a newly redesigned interface, a full HD iPad version, and improvements to MagicPlan Cloud which allows the startup to exchange data with partners via web services. The technology, in case it wasn’t clear, isn’t just intended for use by homeowners looking to get a quick layout of their home, it’s also available to the company’s partners across a number of industries, like real estate, home improvement, crime scene investigation, insurance, home inspections and more. The startup has already been fielding inquiries from notable names in these areas, like CBRE, Dassault, several law enforcement agencies (LA County Sheriff’s office, e.g. ), Century 21, Floorplanner, and a top home improvement chain here in the U.S. However, it has established just three partnerships coming from those calls so far: Seloger (France’s Zillow), RTV (Real Tour Vision – a provider of real estate tours in the U.S.), and Moobz (the Century 21 technology provider). Gaubil also says that the Canadian company, a team of five foundes, just created Sensopia U.S. based in San Francisco, and he’s relocating there in July. They’re now in the process of fundraising.